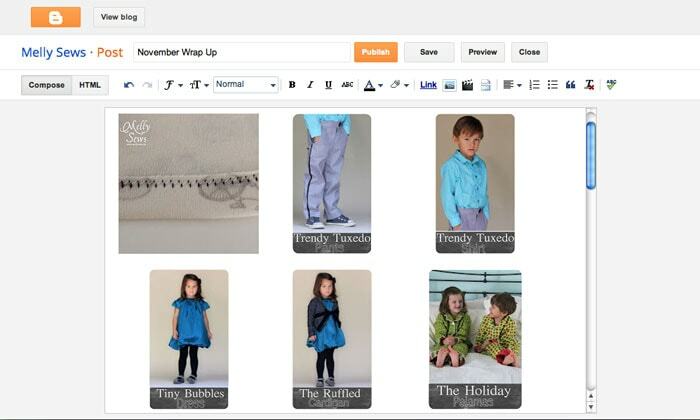 Have you ever wondered how to make a table full of linked images (like the ones you can see on my tutorials page)? 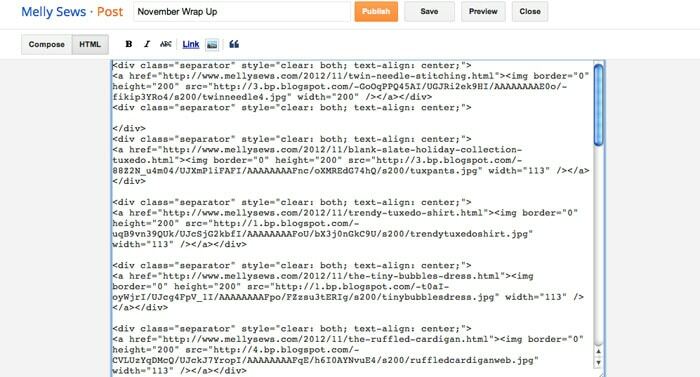 It’s a handy little piece of HTML that I’ve learned, and it will work in both Blogger and WordPress. And it’s not hard to do, I promise! 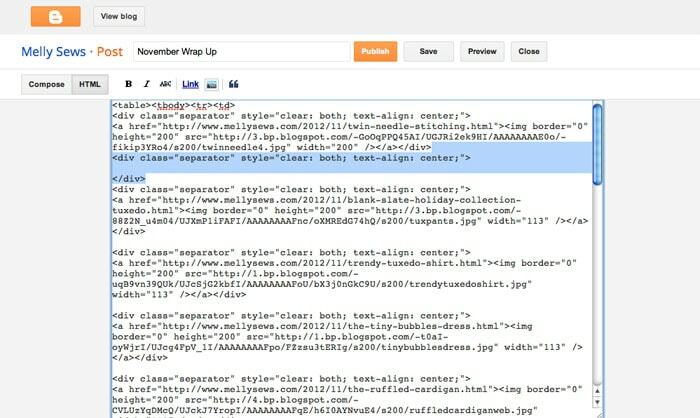 So keep reading, today I’m going to show you how to make an HTML image table in both Blogger and WordPress. BIG DISCLAIMER ON THIS TUTORIAL: I am not a web expert, I won’t rewrite your code for you, and I take no responsibility if you waste a lot of time and/or totally mess up a page using these instructions. This method works for me, but I’m sure there are other (perhaps even better) ways to do this. To make an HTML image table, you’ll need to know just a couple of things about HTML. Step 1: Open a new page or post, whichever you’re using. 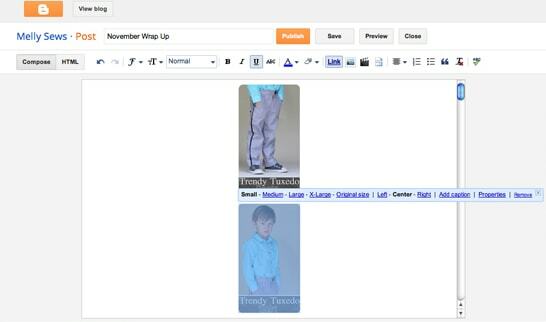 Insert all the pictures you want in your table, in the order you want them, and resized to the size you want them. They’ll all be in a long line down the page at this step. Make sure to hit enter in between each picture so they’ll have space between them – this will make it easier to see what’s what when you go over to HTML. Step 2: Next, click on each picture to highlight, then click link. 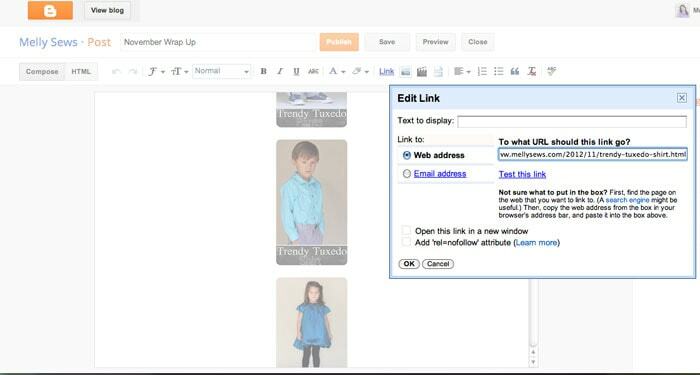 Leave “Text to Display” blank, and copy and paste the page you want this picture to link to in the “Web Address” box. Repeat this for each picture. 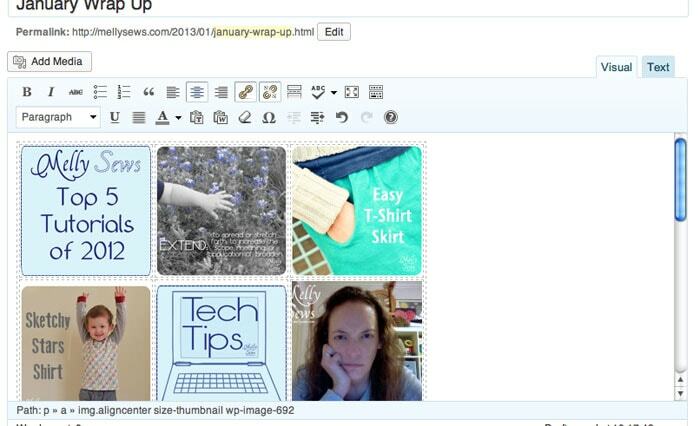 We’ll continue the Blogger Instructions after the WordPress Step 1 & 2 Instructions. Scroll down to Step 3. 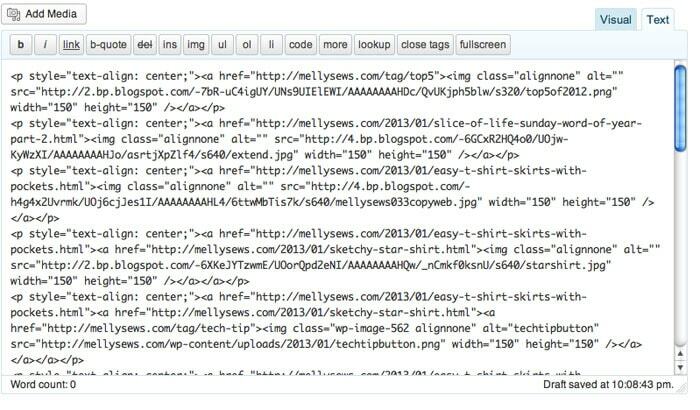 Step 3- Blogger: Now click on your HTML tab. You’ll see a bunch of stuff that looks like this. See the spaces below? Those are dividing my pictures. Depending on how you have your options for posts set up, you might also see tags that looks like this <br></br> where you added the spaces. That’s fine too. 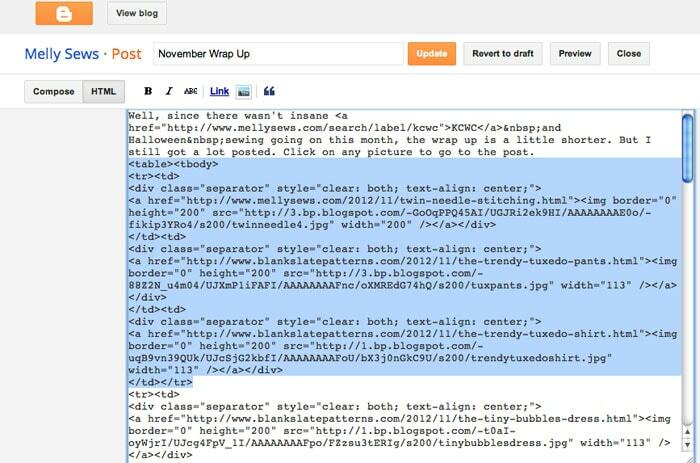 STEP 4 – Blogger AND WordPress Scroll to the very top of your post, and type <table><tbody><tr><td> Then scroll all the way to the end and type </td></tr></tbody></table> You close your tags in reverse order of the way you typed them to begin with, or from inside to outside. This will start your table setup. VERY IMPORTANT: Resist the urge to click back to Compose or Visual mode to see what you’ve done until you are finished editing the HTML. If you click over mid-process, you’ll just mess stuff up and create more work for yourself. Next you are going to create your table rows. Step 5- Blogger only: You’ll notice that each picture+link you created earlier starts with the tag <div> and ends with </div> You’re going to want 3-4 pictures per row. You already started the first row in the step above. Count down 3 or 4 pictures in your HTML, and after the 3rd (or 4th) </div> tag add </tr><tr> to close one row and begin another. ANOTHER IMPORTANT POINT: You might see extra <div></div> tags with nothing in between them. Those are your spaces between pictures. You can delete these as you go (see mine below). If you don’t have these, this is where you will see the <br></br> tags. You can delete those too. Step 5 – WordPress only: Remember, each picture+link you created earlier starts with the tag <p> and ends with </p> You’re going to want 3-4 pictures per row. You already started the first row in the step above. Count down 3 or 4 pictures in your HTML, and after the 3rd (or 4th) </p> tag add </tr><tr> to close one row and begin another. So, after each picture+link is enclosed within <td></td> tags, you are done! 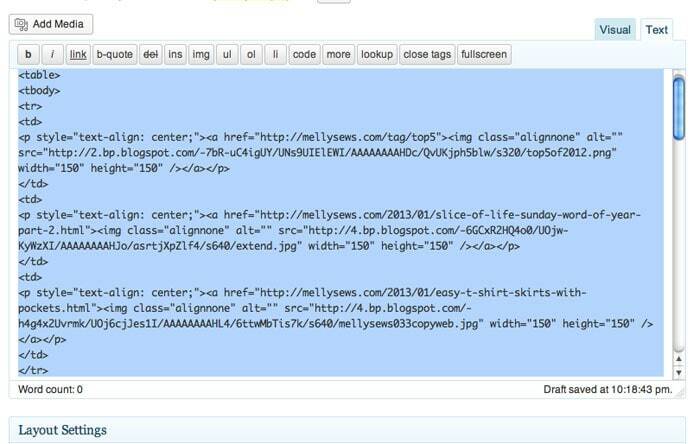 You can see what the first row of my table looks like in Blogger in the highlighted HTML below. One Final Important Note: If you want to add captions to your photos in the table, do this AFTER you’ve created the whole table. You can click on any picture to add the caption. The reason you shouldn’t do it before is because captioning creates a table within a table, which can make your HTML much harder to read because there will be a lot more <table> <tbody> <tr> and <td> tags throughout. I’ll give it a try….. WONDERFUL tutorial! Thank you, I’ve often wondered how this is done! I love your Tech Tips (and your other stuff too 🙂 )! Very helpful info! it worked! i’ve always wanted to do this to my tutorial page and couldn’t figure it out. thanks girl! only difference was mine were center-aligned so i had to delete that at the beginning of each button and just type , an easy fix. THANK YOU!!! Oh…I need sometime to read through the tutorial till the end to try it out. Thank you so much for sharing! Hi Melissa, if anyone has questions about your awesome tech tips, I would be happy to help them. I used to be a web designer. I also created my own blog background using html code. 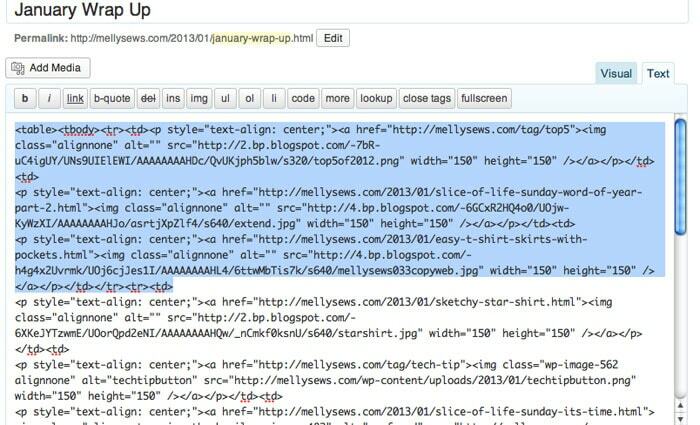 I’m more famillar with blogger over WordPress, but generally, html code is the same anywhere. P.S. I’m the one that has commented a few times and asked if you were here in Austin (I’m in Round Rock and my husband went to McCallum eons ago). Thanks again for all you do. And/or blog enough in a month to do this. Wait- I can totally use this. Thank you, thank you!!! Do you do this on the side? Freelance? I just know how this will end on my end and I would love a resource to have someone create a project gallery page (like centsationalgirl.com blog). This is brilliant – thank you so much, it makes sense and it works – yippee! I just wanted you to know that this tutorial was exactly what I was looking for! Thank you so much. If you’re interested in how my page turned out, you can go here: http://www.theladyokieblog.com/p/blogging.html. Thanks again! Its quote easy, never thought of this. Thanks very much. Yes its easy. Thanks for creating such a simple tutorial. Thanks! the trick is working. It worked on my blog. Yess looks awesome and easy.. Thanks for this trick. Its working good for me. Absolutely fantastic. It worked great.